Roy Makaay was a product from the Vitesse Arnhem youth academy. After successful seasons at the club, he moved to Spain in 1997. He joined Tenerife together with Dutchman Ferdi Vierklau. 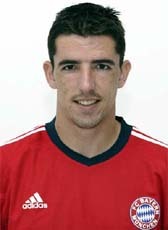 After two seasons, the club relegated and Makaay moved to La Coruña. His period at Deportivo was also successful, helping the club to win the league and being the top scorer with 29 goals. Other European clubs also became interested in the striker. After a long struggle with German club Bayern München about the transferfee, Makaay has been transferred to the German giants. He has signed for 4-years and was at that moment with a fee around the 18ME, the most expensive signing for Bayern in history. His long period at Bayern was another successful era winning several trophies. His nickname was Das Tor Phantom making 78 goals in just four seasons. In June 2007 came the surprising news that Makaay returned home. At the age of 32, he signed a 3-year contract at Feyenoord Rotterdam. In his final season 2009-10 his head coach Mario Been has not given Makaay always a line-up spot. However he played 24 matches and scored 7 goals. His final match was against Heerenveen that he made famous with a hat-trick, his 50th goal in Feyenoord jersey. After retiring from professional football, Makaay started as Feyenoord youth coach.